Team Remission10 is excited to announce that this week we were honored at the LLS National Meeting as the TOP FUNDRAISER in the entire country for the 2017 MWOY campaign raising $378,287! We are also excited to announce the winners of the second and third prizes as well as share a video message from our ROUSH Performance Mustang Winner. How did Scott and Ally get here? Scott was born and raised in Machesney Park, IL and at an early age discovered a passion for sports and motorsports. He began racing at the age of 13 and quickly realized that this was a sport he wanted to be involved in for years to come. Scott is currently the Director of Motorsports for TSMGI, a sport, event, and promotional marketing agency out of Deerfield, Illinois. He manages the Charlotte office and the Motorsports division for the company. Shortly after starting his career in Motorsports, which landed him in Charlotte, Scott was diagnosed with Non-Hodgkin’s Lymphoma and following rigorous testing, underwent 8 rounds of Chemotherapy putting him into remission in May 2007. He is thrilled to be celebrating 10 years in remission from Diffuse Large B-cell Lymphoma this year and what better way to celebrate than accepting the nomination to run for Man of the Year through The Leukemia and Lymphoma Society? Over the last decade he has continued to raise funds for LLS through various programs including Light the Night, Hike for Discovery, and numerous Team in Training events. He was blessed enough to meet his amazing wife Jaci not long after his Cancer journey ended and they now have two amazing and beautiful daughters, Harper, 4 and Nora, 2 and live in Harrisburg, NC. He is passionate about helping others through their own cancer journeys and hopeful that soon there will be a cure! Ally is not your typical eleven-year-old kid. She is someone who has a HUGE heart and cares for others. She loves to be active and started playing softball around age six. She is a strong teammate and, in her eyes, she has ten other sisters who are her best friends. At the age of eight, she started Taekwondo and has worked her way up the ladder. She earned her 2nd Degree Decided Black belt in February 2016 with her high kicks and strong snap, and when it comes to sparring, she can in her words, "take the boys to the wood shack" when she needs to. When it comes to school, Ally strives to do her best. She is an Honor student at C.C. Griffin Middle school in Concord. Good grades have never come easy for her, but she never quits. That has been our motto. She is always trying to better herself when it comes to her studies. As you can see, Ally has accomplished a lot in her eleven years. However, she isn't quite done yet. Cancer has picked the wrong Diva to mess with. In January/February 2016, Ally started losing weight and having night sweats. We thought it was her body getting ready for the change and at first we just dismissed these symptoms. We dismissed the symptoms until the weight loss affected her muscle mass in her arms and legs and we realized she had lost 7.5lbs in 4 months. We took Ally to her pediatrician who performed blood work. At first, she was told to eat more protein, dark leafy greens and take a vitamin with iron. After four weeks we went back for a check-up hoping all her labs and weight would have improved. Her red blood count from March's blood work was 9.5. But she had lost more weight and her red blood count decreased another point to where it was 8.5. Her pediatrician was stumped, so she referred her to a Hematologist. On Monday, April 25, 2016 we met with Dr. Hinson, of Levine's Children Oncology, who examined Ally and ordered a chest x-ray and more blood work. We weren't even to our car in the parking deck when we got a phone call asking us to return to the office. Dr. Hinson already had the results of her chest x-ray, and as parents, our hearts sank, when we were told that Ally had a large mass in her chest just above her heart. She stated that Ally needed to be admitted to Levine's Children's Hospital in Charlotte that night. She was admitted, and started with multiple tests the following day. Ally first had a PET scan to see if there was any other tumors in her body. There were five in total. That Friday, we received Ally's diagnosis, which was confirmed as, Stage 3 Hodgkin's lymphoma. 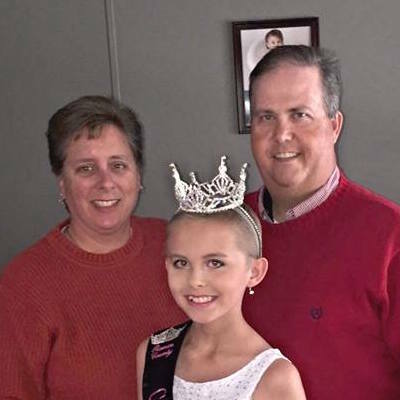 As you can imagine, our family was overcome by shock, even more so because Ally's diagnosis came just one year after her father, Preston, beat Hodgkin's lymphoma. Nevertheless, I can say this. We beat it once and we knew we would beat it the second time for good. Ally had a port placed and began chemotherapy. She did amazing. She was awake and asking the nurse's questions every time they came in. She wanted to go through all the snacks she received over the course of the week and wanted to donate to other patients and parents. This was the Ally we hadn't seen in weeks. She was full of life again. In September 2016, Ally finished her last treatment and is now cancer free. Ally has many names (Team Ally, Diva Ally, Ally Strong). Her Taekwondo family stated that cancer messed with the wrong Black Belt. Her softball team knew she was going to "knock it out of the park". Ally has an amazing support team behind her. Her story has reached so many people across the world. We, as her parents, want to send everyone our deepest thank you for their continuous prayers and support. Why Man & Woman of the Year? The Leukemia & Lymphoma Society was there for us. Through programs like Man & Woman of the Year, The Leukemia & Lymphoma Society (LLS) has invested more than $1 billion in research to advance breakthrough therapies. In fact, almost half of the new anti-cancer drugs approved by the U.S. FDA from 2000 through 2013 were originally designed to treat blood cancers, and LLS helped advance most of them. Digital media from our journeys.